Christmas has not been the same since they stopped bringing out Lord of the Rings films. For three years every Christmas would involve numerous trips to the cinema to sit through hours and hours of orcs, hobbits and wizards fight over the fate of middle earth. If that doesn’t make you feel festive then nothing will. The final (and longest) instalment is called the Return of the King and revolves around Aragorn (Son of Arathorn) returning to Gondor to take his rightful place as king. As he returns there is the obvious conflict between the current Warden of Gondor (Denethor) and Aragorn as Denethor sees his power and influence passing away. You see the great news of a king returning is also the news which brings confrontation and hostility. So we come to Isaiah 9 and we read these words and songs start ringing in our ears as we hear this great news of a child who is born. A child who will bring joy, a child who will bring peace, a child who will bring justice and stability and righteousness. We hear of this child who will be called Wonderful Counsellor, Mighty God, Everlasting Father, Prince of Peace and our minds flash forwards to the Christmas story to visions of a baby sat in a manger surrounded by an ever increasing sea of talking animals and we feel suitably festive and a little bit religious and ready to make the most of the coming yuletide. I can’t help but feel that when we read Isaiah 9 our minds are maybe racing to the wrong place. You see it is true that Jesus’ birth represents the birth talked about here but it’s not easy to see this king in the weakness and ignominy of the stable. Some wise men saw it and brought him gifts for a king. Herod saw it and tried to kill this rival but generally the birth itself looks unthreatening and is easily ignored. 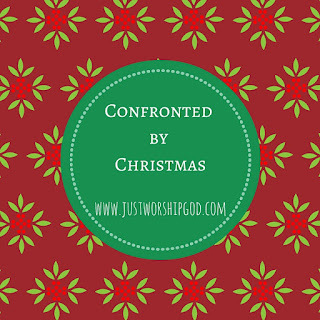 If our minds simply go from Isaiah 9 to Jesus’ birth and then stop there I’m not sure the connection is obvious. No to see just how wonderful Isaiah 9 is we have to keep reading. You see Isaiah 9 is fulfilled in Jesus’ life. When Jesus starts his ministry he starts it by declaring the Kingdom of God is at hand, repent and believe in the gospel. Now gospel simply means good news. So do you see what Jesus is saying right at the start of it all? He’s saying the good news of Isaiah 9 is here. This kingdom which was promised all those years ago is now at hand and Jesus’ great call is to enter that kingdom. Isaiah 9 reminds us that Jesus did not come simply as an inspiring example of how to be a generally decent kind of bloke but he came as the king of a kingdom and he called people to it. So we return to where we started. Aragorn returned and he claimed his rightful position as king. He ultimately brought victory to Gondor and through that came peace and prosperity. The king was here and he offered light in darkness, peace in conflict, justice and righteousness in what had become corrupt and self seeking. But when a new king is on the scene then kingdoms will inevitably collide and power will not be given up easily. It’s maybe taken me a long time to get there but here’s the heart of Isaiah 9 and it’s what should go through our minds every time we hear these words read or sung this Christmas. 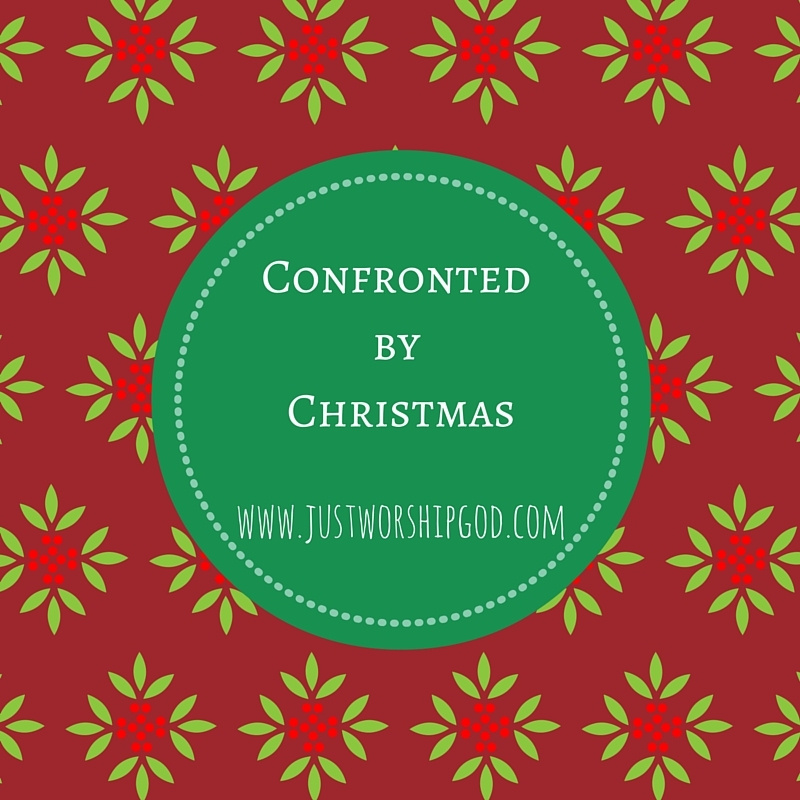 Christmas is the time when we remember the moment when the Kingdom of God burst into our world. It is a great kingdom, a kingdom of peace, joy, justice, righteousness, prosperity and stability. 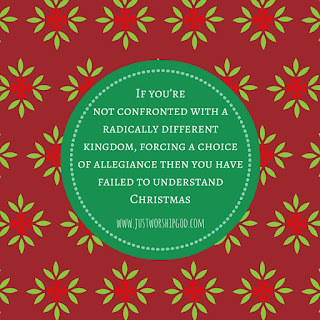 It’s a kingdom run by a king who can be legitimately called ‘Wonderful Counsellor, Mighty God, Everlasting Father, Prince of Peace.’ This kingdom is here but it stands against all other kings and all other kingdoms. Jesus repeatedly says you can’t serve him and other things so either Jesus is the king or something else is. Either you’re a part of his kingdom, or you’re not. So I don’t know what the king of your life is – Maybe it’s you? Maybe it’s family? Maybe it’s success? Maybe it’s popularity? Maybe it’s money? I don’t know, but Isaiah 9 reminds us of what Jesus repeatedly said. There is a new kingdom, a better kingdom but if you’re going to be a part of that you do not need to go to church a few times, you don’t need to give a bit of money away, you don’t need to get a bit of religion in your life but you need leave the kingdom you’re in now, you need to reject the king you follow now and you need to find a new kingdom, with a new king and new values and become part of a new people, the people of God. 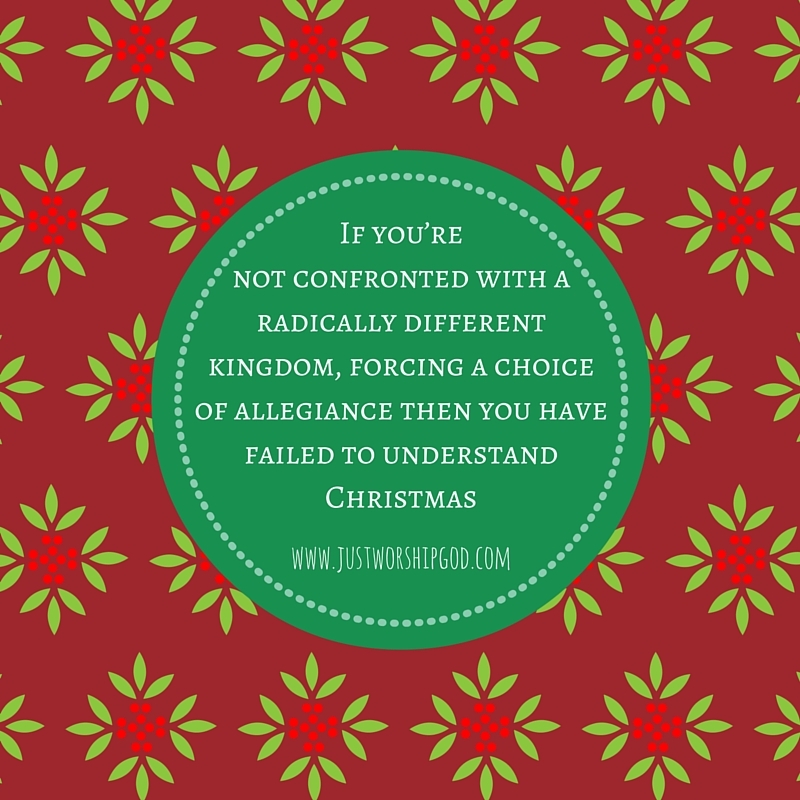 If at Christmas you’re not confronted with a radically different kingdom which forces you to choose your allegiance then you have failed to understand Isaiah 9 and failed to understand Christmas and failed to understand Jesus at all. The good news of the return of the king and a new kingdom must also be the good news which strikes terror into every other king in our lives or it is not good news at all, in fact it’s not even news.